First of all, Happy Fourth of July weekend! 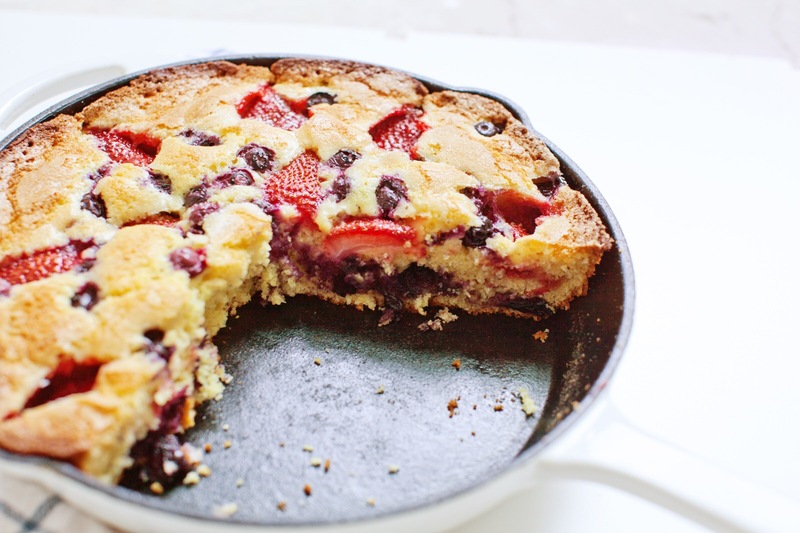 I’m literally sitting on the beach right now as I type this but I just HAD to share the amazing strawberry and blueberry cornmeal skillet cake my husband made for breakfast this morning. It was so good I forced him to write down the recipe for you guys because you need this in your life. It has crispy buttery edges and a nice tender middle with lots of tart berry flavor. It’s so easy to make, too! Ok blah blah blah enough talk. Here’s the recipe. 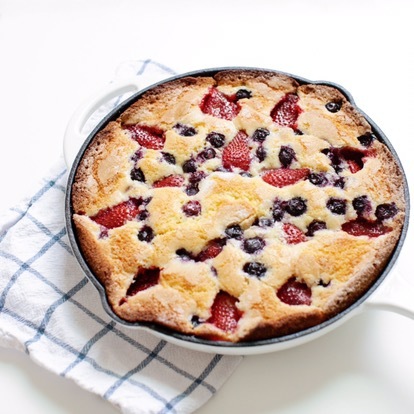 Preheat the oven to 375 degrees F and place a 10-inch cast iron skillet inside to heat while you make the batter. In a large bowl, whisk together the cornmeal, flour, sugar, salt, and baking powder. In a separate bowl, whisk the buttermilk, eggs, and the melted butter, reserving 1 tablespoon for the skillet. Pour the wet ingredients over the flour mixture and whisk until just combined. Carefully remove the hot skillet from the oven. Coat the bottom and sides of the hot skillet with the remaining butter. 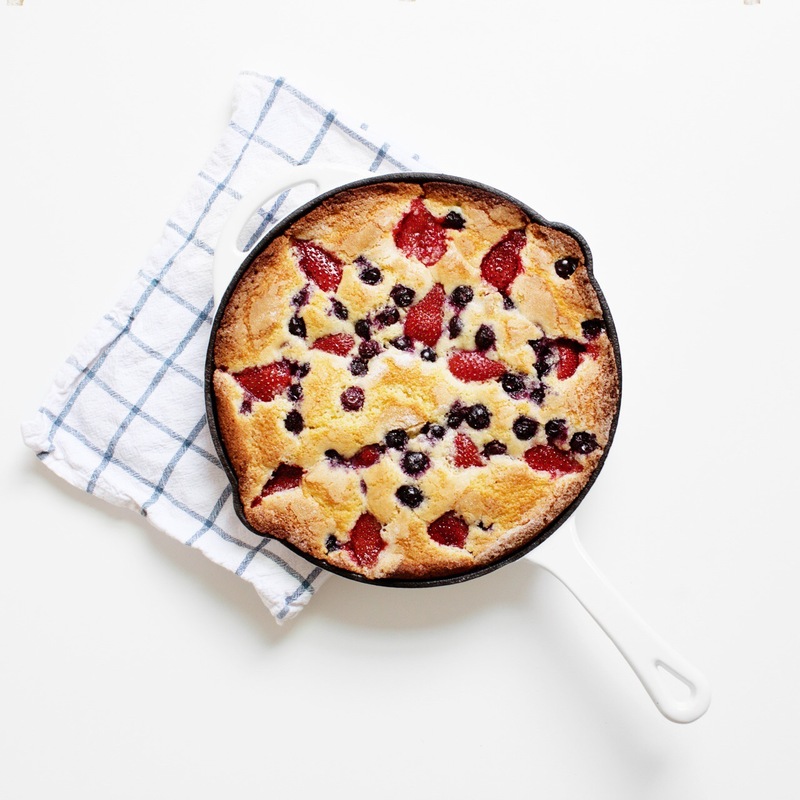 Pour the batter into the skillet; scatter the blueberries on top, and place the strawberry halves evenly over the blueberries. Sprinkle with as much sugar as you’d like, we used about 3 tablespoons. Bake for about 45 minutes, until the top is evenly browned. Allow to cool for 10 to 15 minutes and serve.